I didn’t even see it until I backed out of the driveway. Maybe the van nudged the nearby tree just enough to push it out. Maybe it was already there, though it didn’t have a squished appearance that would indicate it’d been run over. Since I was leaving, and on a timeline, I called my daughter and had her run out to inspect what looked to be a well-formed nest, toppled over now, lying in my van’s path of the driveway. I hoped it was empty, and she confirmed that it was before carefully setting it on the front steps for later. When later came, I bent down to get a closer look, and indeed, it looked to be an abandoned nest. What had caused the birds to leave? Had its babies grown and flown? Or had something else prompt an urgent relocation — perhaps the loudness of our household bursting through the front doors to take in the long-awaited spring weather? I may never know. 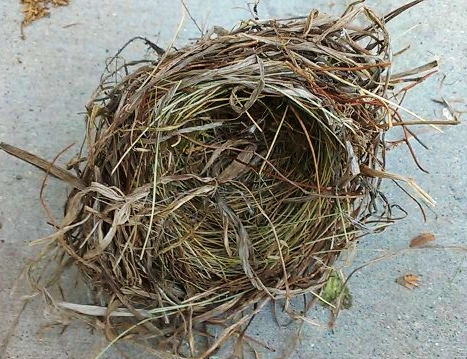 What I do know is that while nests have always been something of a curiosity to me, this one struck me in a new way. Perhaps because it seemed so fresh, I couldn’t help but think of the little creatures who’d fashioned such a vessel, this twigged crater meant to harbor new life. Some of the twigs were brown; others, newer, greener. It was splendid, really, this thing from nature that looked so refined. Later, I reflected on that theme of persistence and how it relates to the faith life. We don’t always know where we’re heading, do we? Well, we know the destination, but it’s hard to see sometimes what exactly we’re doing as we fashion our world, detail by detail, sometimes almost as if by rote, and definitely by some compulsion we sense but can’t completely wrap our “bird brains” around. Being a city girl, I don’t have a millions chances to sit and reflect on nature, and yet whenever I do, it seems nature always teaches me a little something about my relationship with God. What the birds have told me this week, through revealing their nest (whether they wanted to or not) is that I must keep going, keep bringing in each offering of love, one by one, step by step, even when I can’t see the beautiful thing that is going to result; the lovely life-giving thing that will harbor something — maybe a hurting soul, maybe a grieving heart. Someday, we’ll all experience a forced exit. We cannot cling to this life or our work forever. But as long as we’re given this day, this vantage point, these tools, and whatever insight with which we’ve been blessed, we must do this work, and if God really resides in our heart, perhaps sing a little song while we go, minute by minute, dedicating ourselves to that beautiful thing that urgently demands our time and attention: life and what we’re here to do. Amen- so well said. I was reading last night about how God values persistence. It was enlightening to read about how He values details- like bird’s nest creations- and how we need to simply pay attention and do the very best we can with the details in our day. We get so “grand” sometimes in our thinking, when simple will do oftentimes. I love that our thoughts are synchronized today!